A CRJ-100ER passenger plane, operating on a United Nations flight, was destroyed in an accident at Kinshasa-N'Djili Airport (FIH), Democratic Republic of the Congo. The airplane carried 29 passengers and four crew members. One passenger survived the accident. The airplane operated on behalf of the United Nations Organization Stabilization Mission in the Democratic Republic of the Congo (MONUSCO) on flight UNO834, a round trip from Kinshasa-N'Djili Airport (FIH) to Kisangani (FKI). 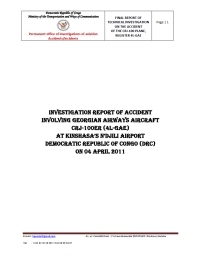 The aircraft took off from Kisangani for Kinshasa at 12:18. The pilot in command was the pilot flying on this leg. At 13:31, the crew reported to Kinshasa Approach that they were over position GURUT (137 NM from Kinshasa), gave their Expected Time of Arrival Kinshasa as 13:55 and received the latest Kinshasa weather information. At the time, Kinshasa weather being reported was wind 340 degrees, 8 knots, visibility 10 km, scattered clouds at 2500 feet, Charlie Bravos (CBs) at 3000 feet, CBs in the North East and South East, Temperature 33, dew point 23, QNH 1009, trend NOSIG. At 13:39, UNO 834 requested for descent and was cleared to descend to flight level 100. Meanwhile, on the on-board weather radar, the crew were able to notice presence of severe weather around and over Kinshasa airfield. At 13:49, when the aircraft was about 32 NMs from Kinshasa VOR/DME, the crew again sought latest weather information from Kinshasa ATC. They were informed that Kinshasa was reporting "wind 210 degrees, 8 knots, visibility 8 KM, thunderstorm over the station, scattered cloud at 2500 feet, few Charlie Bravo 3000 feet, Charlie Bravo located north-east, south west and west, broken 12000 feet, temperature 33, dew point 23, QNH 1008, trend NOSIG". The co-pilot replied to ATC that weather was copied and read back the QNH. At 13:50, UNO 854 was cleared for a straight-in Localizer approach for runway 24. The crew discussed options of avoiding the severe weather being displayed on their on-board weather radar by skirting around the radar returns. The aircraft approached the airfield at high speed. The indicated air speed came below 250 knots at 13:53 when the aircraft was descending through an altitude of 4630 feet and was 13 NM from threshold runway 24. As the aircraft came close to the airfield, the co-pilot sighted the runway on his right one o'clock position, when the aircraft was about 9.7 nautical miles from displaced threshold of runway 24. The PIC too, sighted the runway when the aircraft was about 6.4 NM away from threshold. At that stage, the aircraft speed was 210 knots, altitude was 3250 feet (or about 2252 feet above ground level) and the aircraft was in clean configuration. The crew decided to continue their Approach. The captain disengaged the autopilot, turned towards the runway and gave instructions to co-pilot to configure the aircraft for landing. The crew managed to regain Localizer path and align the aircraft to the runway by the time they were 2 NM from the threshold. At around this time, Kinshasa airfield was affected by a squall line. As the aircraft came on short finals, it encountered rain. By this stage, the aircraft was below the Minimum Descent Altitude (MDA) for Localizer Approach for runway 24. MDA for Localizer Approach for Runway 24 is 1470 feet or 472 feet Above Ground Level (AGL). The crew switched on wind shield wipers. As they descended further to about 224 feet AGL and runway was not in sight, the crew decided to carry out a go around. During the process of go around, a positive rate of climb was established with appropriate airspeed. gust/downdraft caused a significant and sudden pitch change to the aircraft which resulted in a considerable loss of height. Being at very low altitude, recovery from such a disturbance was not possible. Distance from Kisangani-Bangoka International Airport to Kinshasa-N'Djili Airport as the crow flies is 1219 km (762 miles).